Cucumber plant: When will I get female flowers? Yep, that's normal for me. The female flowers usually appear several days after the male flowers. If it takes longer than a couple of weeks, I'd say something is wrong. If I remember correctly the first flowers to show up (the ones with the small looking cucumber on it) are actually female flowers. I have been watching mine daily because I've had a hand full of female flowers and it took about a week to see any male flowers. They will come and some of the early female flowers will most likely die off from not getting pollinated soon enough but in the end things will be OK. Male first is the norm in nature because the strategy is to produce as many offspring before you die as possible and that is easiest by getting out millions of energetically cheap pollen grains before producing energetically dozens or hundreds of costly ovules/seeds. It even happens in fish that change sexes, male first then female. That being said, even though the Ag websites say tassles first, my Indian corn put out silks before tassles this year, which would ensure cross pollination. TZ -OH6 wrote: Male first is the norm in nature because the strategy is to produce as many offspring before you die as possible and that is easiest by getting out millions of energetically cheap pollen grains before producing energetically dozens or hundreds of costly ovules/seeds. It also gives bees an opportunity to develop their grazing/pollinating habits on the "cheap" flowers, so they'll be there when your expensive flowers bloom. This happens to a lot of us; nothing to worry about, though. The female flowers will catch up. In fact, 2 of my zucchini just opened their first female flowers today. How do you know the difference between female flowers and male flowers? I am very new to gardening and I have both zucchini and cucumber plants. The zucchini are producing zucchini but my husband insists that they are too small to pick and eat. How do you know when they are ready? My cucumbers are growing like crazy and they seemed to have started to grow 2 cucumbers but then they turned brown. Any helpful hints or tips on these plants? Female bloom is attached to a small cuc or zuc: Males just have a stem attaching them to the plant. I typically get female blooms first, I'm thinking temperature has allot to do with various plant hormone production. Cooler here, so the plant has to hurry & get some seeds fertile, so females first & hope for an insect to bring in some pollen. Even before the stage BDave showed you. You an see a small round protrusion, like a small marble, which will become the fruit at the base of the female flowers. The Male flower will not have this. When you start getting fruit look at them you will definitely be able to tell after you have seen the difference. Thank you for pointing that out to me! I will have to take a look when I get home. Your zucs are the same size as mine are. Are they ready or will they get bigger? Matilda01 wrote: Your zucs are the same size as mine are. Are they ready or will they get bigger? Get bigger Ha Ha Ha Ha LOL . Sorry but I had to laugh, not at you but with you! I know this was directed at BoggyDave. But obviously you have never grown Zucs before. Those in the picture are just wee little baby's. You might get some that are 12 - 18 inches long. They tend to hide under the massive foliage as well, so one day when you think nothing is growing you peek a little something, move some leaves and if you were sitting in a chair you would fall out of it after seeing the size of that hidden zuc. You are gonna be very happy when they start coming in. gixxerific wrote: But obviously you have never grown Zucs before. Those in the picture are just wee little baby's. You might get some that are 12 - 18 inches long. They can also grow incredibly fast, if conditions are right. 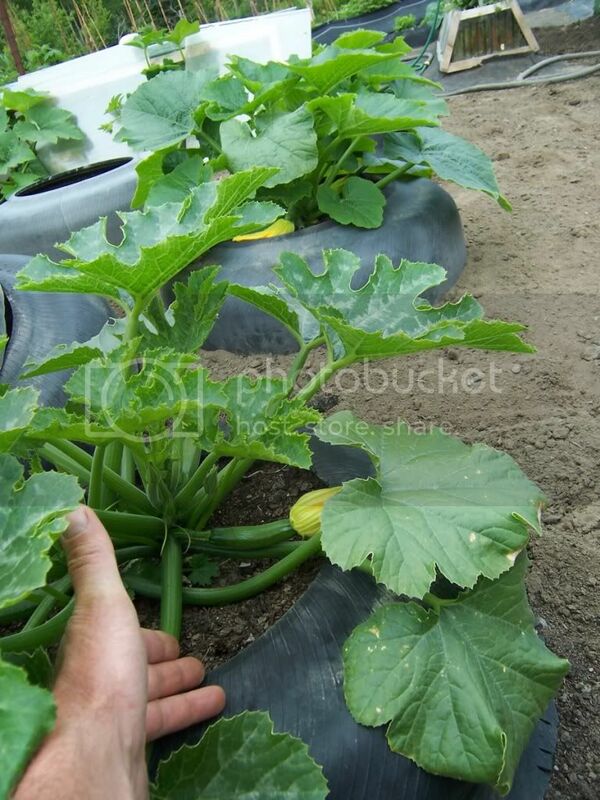 I've seen zucs grow from the size in your picture in the morning to 15" by nightfall. No kidding! You can almost see them growing. Where do female cucumber flowers grow? Cucumber has no male flowers, cantaloupe has no female ones!